Run Application Method in VBA is used to runs a procedure or function which is written in Visual Basic Application. Please find the syntax and remarks of Run Application Method in VBA. Here syntax for Run method of application object in VBA. Macro: It is an Optional parameter. It is used to run the macro. Arg1 to Arg30: It is an Optional parameter. It is used to passed to the function. In the above syntax Application represents object and Run is the method of Application. 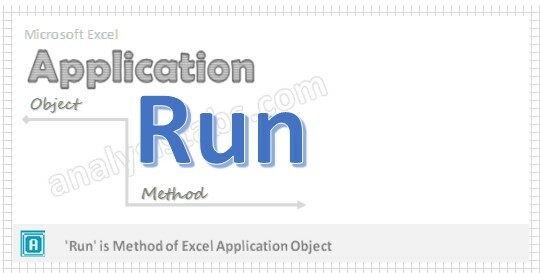 Please find the below example for Run method of application object in excel VBA. Please find the below remarks of Run method of application object in excel VBA. • We cannot use named parameters in this method. • We cannot pass objects as parameter to procedures by using run method.